That’s probably not the exact scenario but a recent article in Current Biology claims that most if not all of today’s living polar bears are descended from one Scottish brown bear. Mama bear lived in Ireland near the peak of the last Ice Age 20,000 to 50,000 years ago. Increasing Arctic ice flows likely brought the polar suitors into contact with the brown bears. As the ice receded, the polar bears drifted back to their icy Arctic island, but with a little going away present from their lovely brown sweethearts – a neatly wrapped package of mitochondrial DNA (mtDNA). Biologists and researchers have long been aware of the polar-brown bear dalliance but it was thought these trysts originated on the Alaskan “ABC” Islands (Admiralty, Baranof and Chicagof) around 14,000 years ago. However, new international research spearheaded in part by Beth Shapiro, assistant professor of biology at Penn State found DNA evidence in the skeletons of 17 brown bears from eight different cave sites in Ireland that predates the Alaskan peccadilloes by 10,000 years or more. Dr. Ceiridwen Edwards of Oxford University, the Current Biology paper’s head author noted that the DNA from the older brown bear remains (38,000 to 43,000 years ago) had basically the same DNA structure as today’s European brown bears. 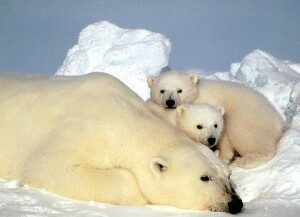 But the DNA from younger specimen (10,000 to 38,000 years ago) more closely resembles that of modern day polar bears. Researchers further studied the matrilines (line of descent from mother to offspring) of 242 polar and brown bears, including living bears and fossil records through 120,000 years and across their present and past geographic ranges. Results strongly suggest that all of today’s living polar bears carry that little mtDNA package of brown bear genes from Ireland. Shapiro finds this scenario especially intriguing because studies of nuclear DNA show that brown bears and polar bears diverged from a common ancestor around a million years ago. In a recent interview with National Public Radio, Shapiro said that the last Ice Age brought the two species back into contact and that interbreeding occurred then the ice retreated, once again separating the species. It has definitely piqued the researchers’ curiosities. One of the researchers, Mark Thomas of University College London said the study shows that species may not be as fixed and tidy as we would like and that hybridization is not necessarily a death knell for a species. He pointed to recent studies by Stanford’s Peter Parham that shows Europeans gained genes that helped in battling northern diseases from interbreeding with Neanderthals. Today polar bears and brown bears (Kodiaks and grizzlies) are once again coming into contact. This time, however, it’s the shrinking Arctic ice cap and the encroachment of the terra firma bound browns into former polar bear habitat that is precipitating this contact. But the results are the same – interbreeding. The resultant hybrids are known as pizzly bears or grolar bears.